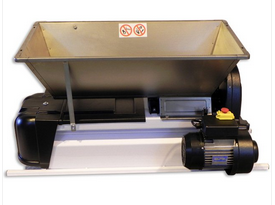 This motorized crusher/destemmer will fully prepare your red grapes for fermentation or white grapes for immediate pressing with minimal effort. Through gentle pressing and near elimination of all the stems, your white wine will ferment nearly tannin-free, and your reds are totally tannin controlled (by actually placing 10% of the stems back into the fermenting must!). This particular model has a stainless hopper and painted lower body. The stainless hopper is easily cleaned and will not rust.